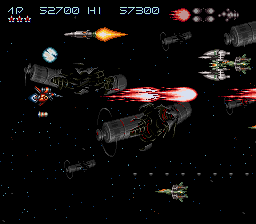 How would Konami follow up their hit SNES shooter, Gradius III? Why, with Axelay of course. 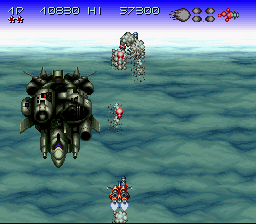 At first, you might be disappointed this isn’t a direct sequel to Gradius III. 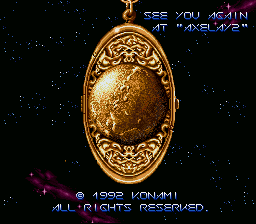 But that thought quickly subsides the second you play Axelay. It’s a technical marvel in many ways, displaying the various capabilities of Nintendo’s 16-bit wonder. 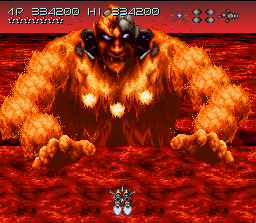 Although the game only features six levels, each level is memorable and concludes with a massive, screen-filling boss that are among the very best in 16-bit history. 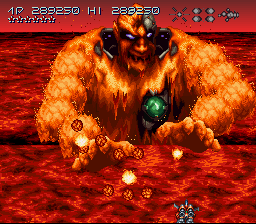 From a terrifying multi-jointed robotic spider to a gigantic fire-spewing lava lord, Axelay stands as one of the best shooters on the Super Nintendo. 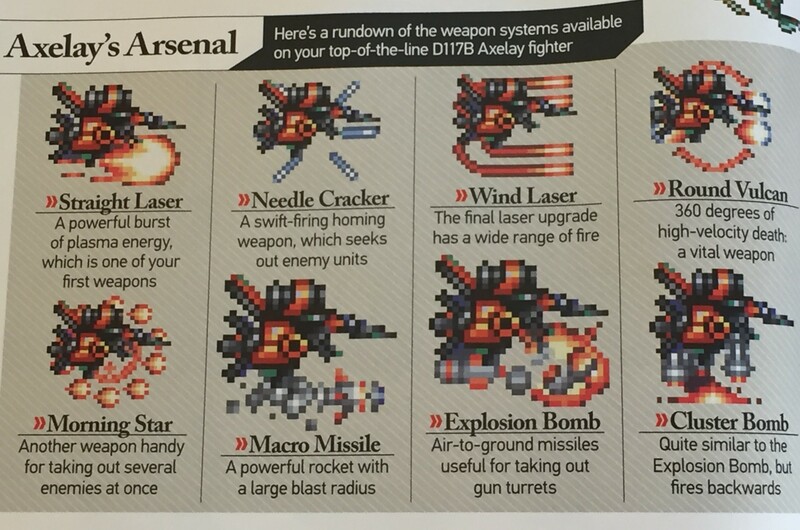 Unlike most shooters, Axelay starts you out with your three main weapons. 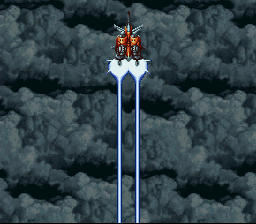 As you progress through the levels, your weapons receive a power-up boost. 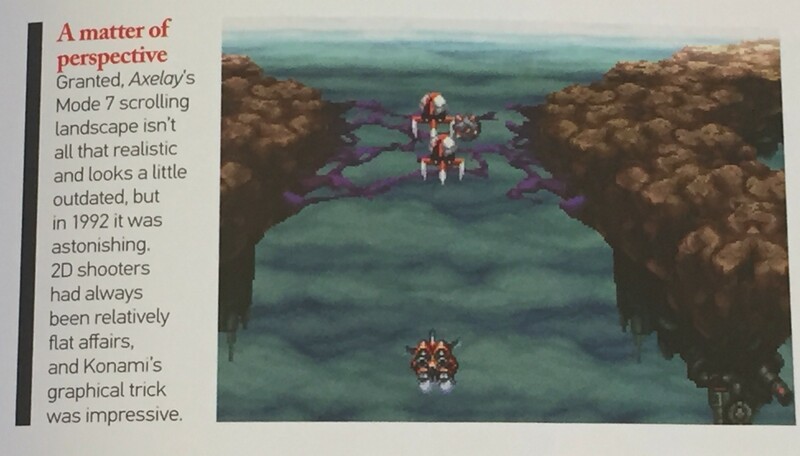 Another unique aspect of Axelay is the way in which your ship sustains damage. 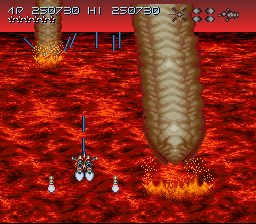 Getting hit by enemy fire causes you to lose whatever weapon you currently have equipped. This means you can take three hits before losing a life. 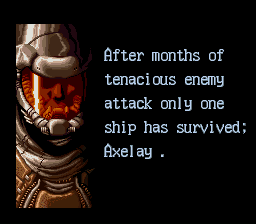 However, kiss your Axelay goodbye if you make direct contact with an enemy ship or the environment. It works extremely well and makes playing Axelay a blast. Something wicked this way comes. 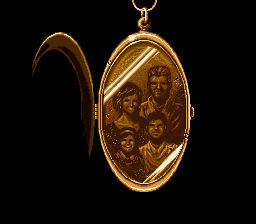 A family man admires his cherished family photo before facing the nearly insurmountable task that lies ahead. 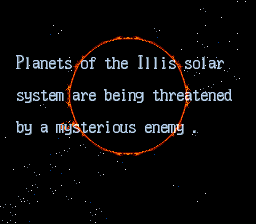 Corliss is being threatened by a terrible alien force. 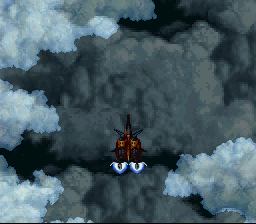 There’s only one aircraft that can save Illis… Axelay! 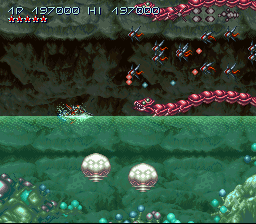 Players are instantly introduced to an impressive scrolling world that sets the tone for all that is to come. 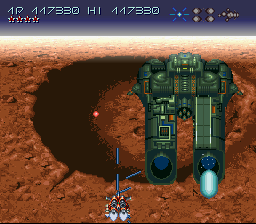 Axelay is easily one of the best looking SNES games of 1992. 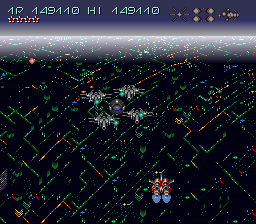 There is sort of a funky gravitational pull that takes a moment or two to adjust to, but you’re off to the races blowing up the Alien Armada. You have access to all three weapons off the bat, so switch accordingly when necessary. Visuals are rich and vibrant. 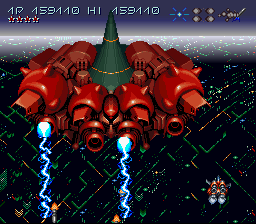 Axelay was further proof that few firms did it better than Konami in the early ’90s. 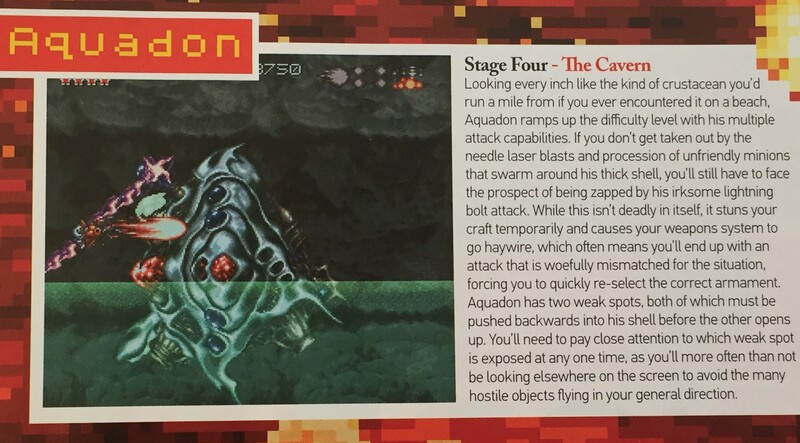 Meet the boss of stage one: the terrifying Arachnatron. 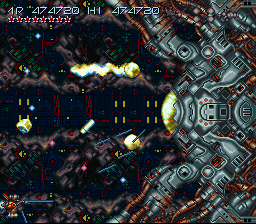 BLAST your way through space before arriving at an enemy base. 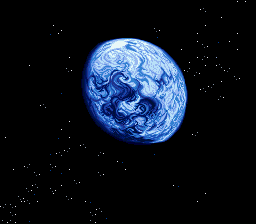 Corliss, the planet which you call home, can be seen in the backdrop as a reminder of why you’re on this suicide mission. 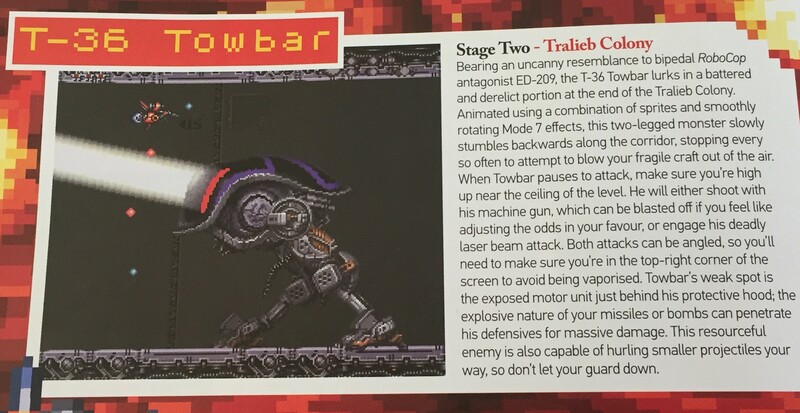 At level’s end, you come face to face with the T-36 Towbar — a war machine designed to impede a rebellion. 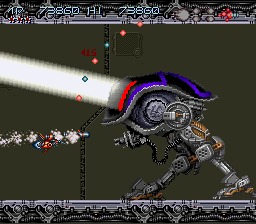 Konami definitely drew inspiration from the ED-209 of RoboCop fame. Urbanite is one of my favorite stages. Flying over the vibrant multi-colored lights of the city below is just so damn atmospheric. Even better is working your way through a network of barriers, with the more vulnerable segments needing to be blasted for passage of safety. 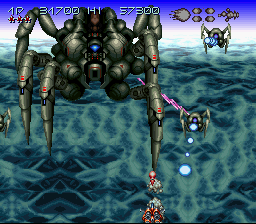 Axelay has its share of mid-bosses. 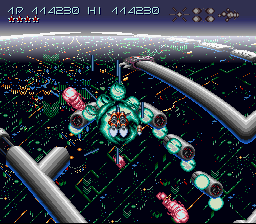 There’s nothing I love more than a space shooter with mini-bosses galore — well, except perhaps blasting an Alien Armada to Kingdom Come against the beautiful backdrop of a neon city at night. Regenertoid starts out as a funky looking black spinning top, but wearing it down reveals a sinister battle station with enough firepower to make MechaGodzilla blush. 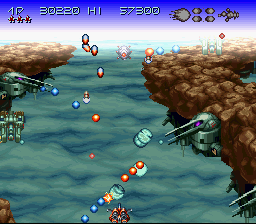 Space shooters and water-based stages nearly go hand-in-hand, and Axelay is no exception. 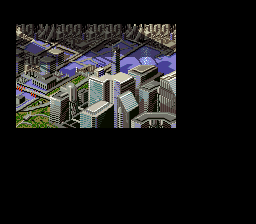 Beautiful details like the water splashing as you go in and out speak to the level of care that Konami exercised. 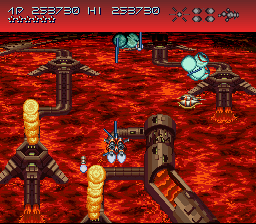 Water stages in platformers can be annoying but I love them in my SHMUPS. 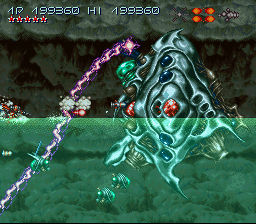 Once you reach the end of this level, prepare to battle the aggressive Aquadon. It’s got two weak spots but good luck focusing on which one reveals itself against the litany of hostile objects and laser beams flying at ‘cha! Giant worms come barreling after you in a fashion that is reminiscent of Frank Herbert’s sci-fi classic, Dune. 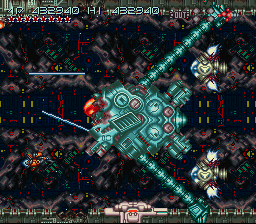 This level is easily the most visually impressive of the entire game. 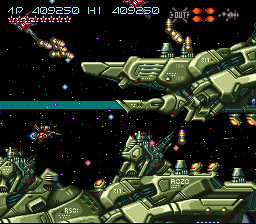 Gradius fans can’t help but smile at Konami’s nod here. But just when you think it doesn’t get any cooler, Wayler rises out of the fiery depths to completely blow your mind. 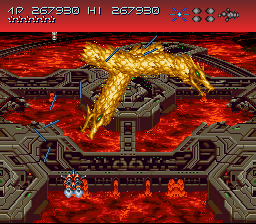 This diabolical demon is easily one of the most memorable bosses in 16-bit lore. 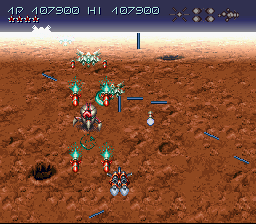 Battle your way through a hostile alien fleet and infiltrate the enemy base. Intensity quickly picks up as the alien empire throws everything it has against you. Veinion is the evil leader behind the army. 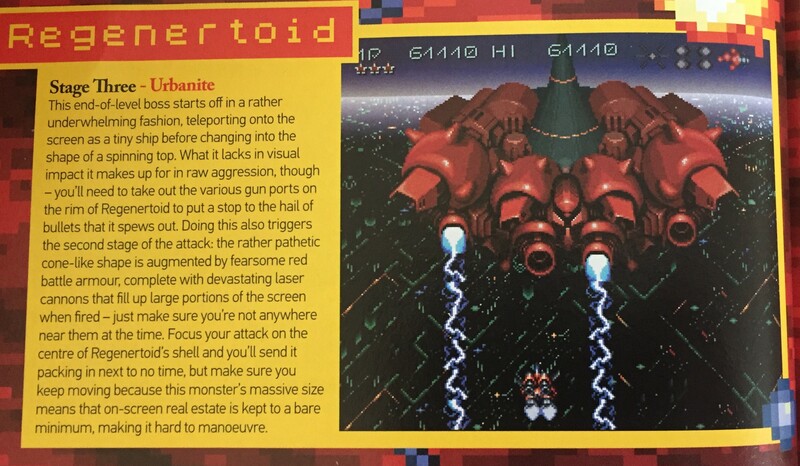 At first glance it appears to be some generic robotic overlord but after pelting away at it, it reveals its true form as a horrific alien organism. 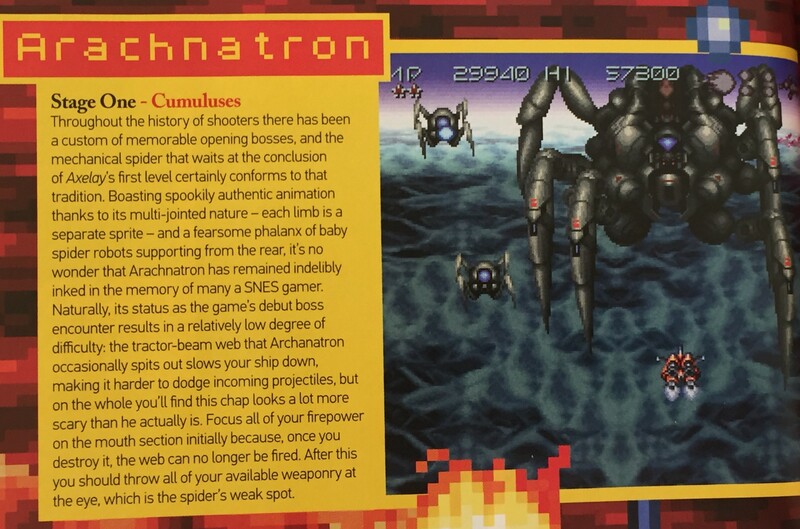 You wouldn’t expect anything less coming from Konami. 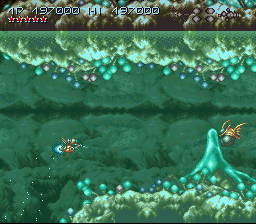 Axelay is often hailed as one of the greatest SNES shooters of all time. 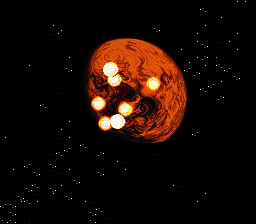 One playthrough and it’s easy to see why. 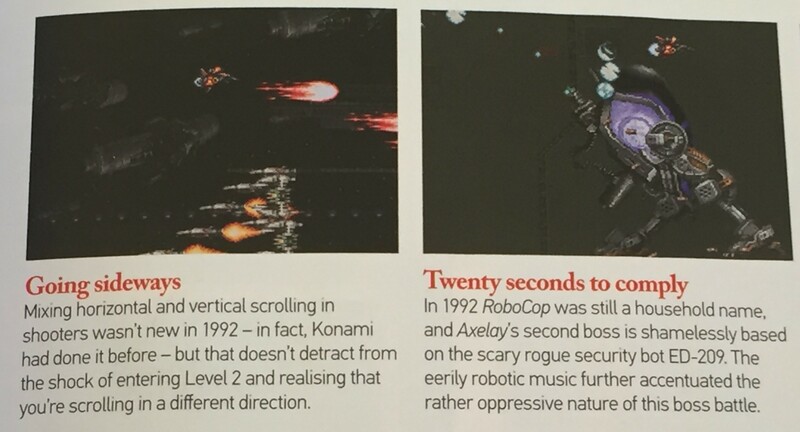 EGM gave it scores of 8, 9, 9 and 9. 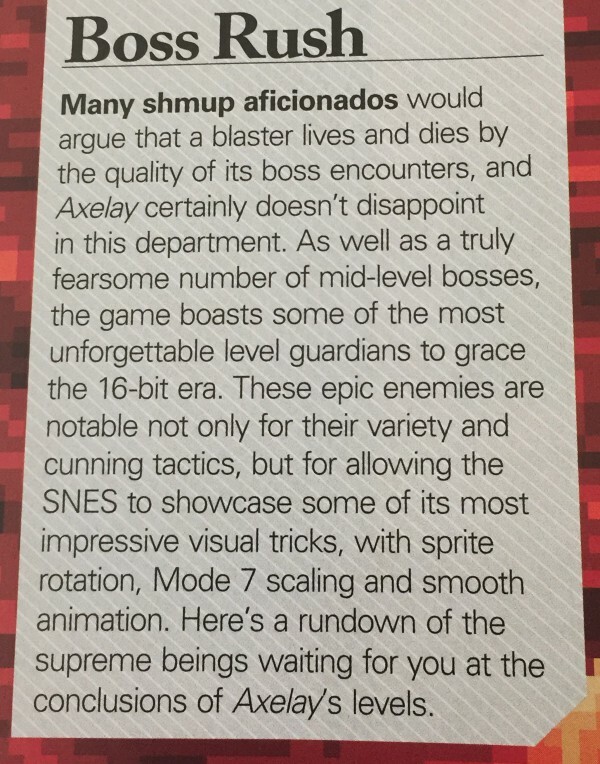 Super Play rated it 85%. 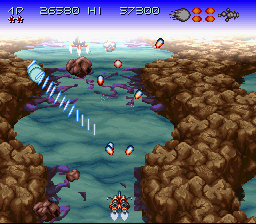 Many fans agree that Axelay is one of the better shooters of the entire 16-bit era. 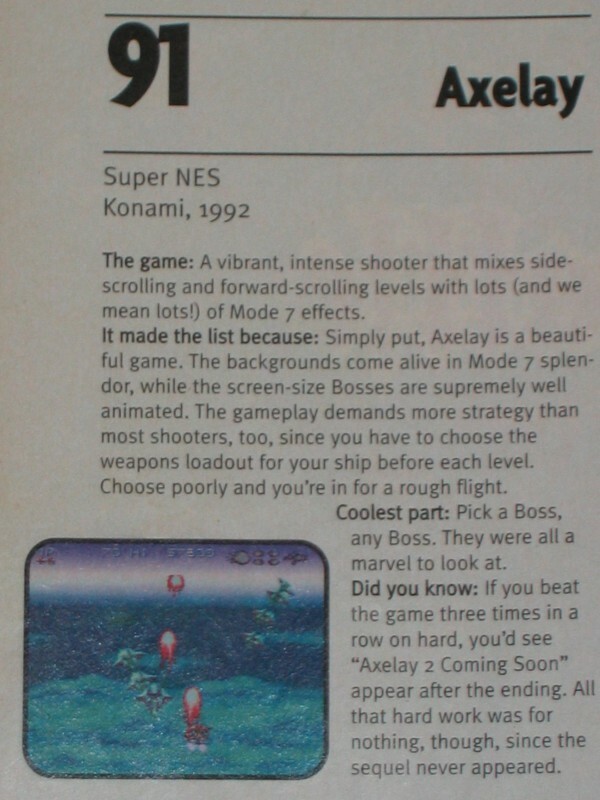 As the EGM blurb above mentions though, many were also disappointed that an Axelay 2 never became a reality, as hinted at the conclusion of the game. What a tease! It’s rather reminiscent of Shadowrun. 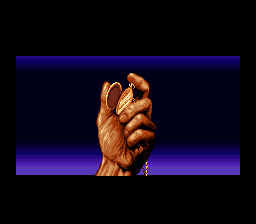 Axelay is a technical marvel and yet another Konami stamp on their 16-bit résumé. 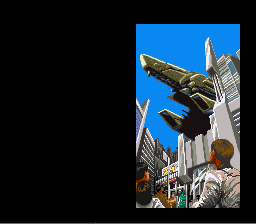 From the moment you boot the game up, you find yourself waging war against an alien empire as your ship spirals into a vast cloudy sky. 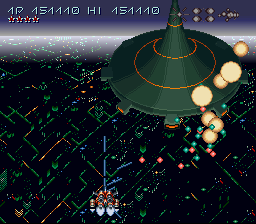 The special effects, music and visuals pound your senses in a way that only Konami (and a few others) could do back then. You knew you were in for a special ride. 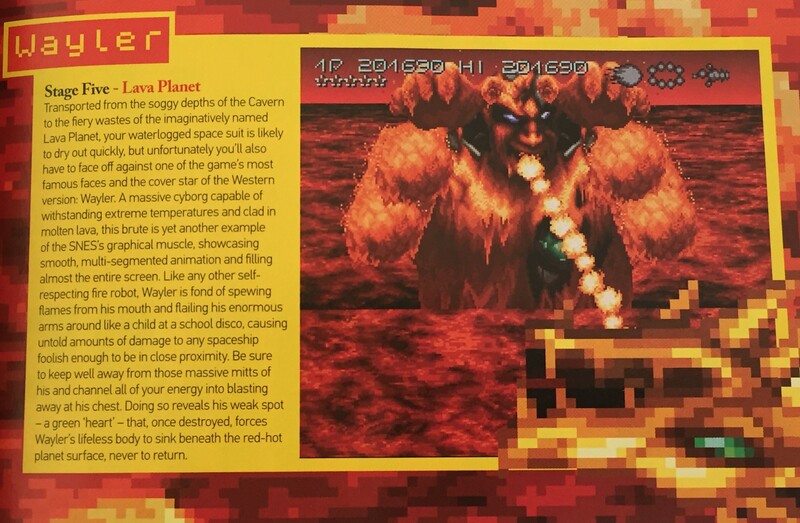 If it wasn’t confirmed by then, then surely it was by the time you reach the guardian of the first stage. A titanic terror, the Arachnatron moves its multi-joints in such a creepy and convincing manner that it makes your skin crawl. 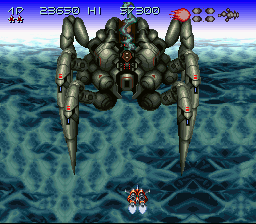 After blasting the robotic spider into thousands of pieces of metal, you’re off to the second stage which then becomes a horizontal side-scrolling affair. The six levels switch from vertical to horizontal in a seamless and impressive fashion. 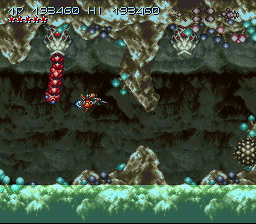 Although there are only six levels and it takes roughly an hour to beat, it’s such a blast that you’ll be revisiting Axelay time and time again. 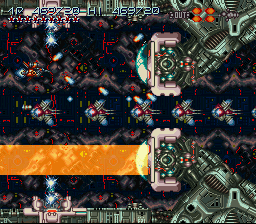 Unlike Gradius III, there isn’t much slowdown to speak of here. 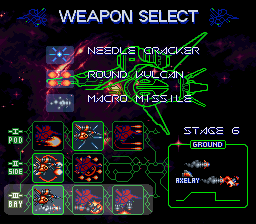 I love that all three weapons are available from the start and that you can upgrade them as you beat each level. 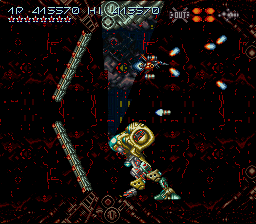 It’s also pretty cool that you lose your guns on bullet hits rather than dying outright. 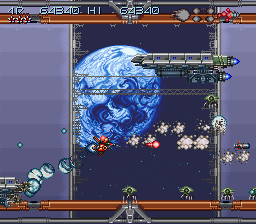 Axelay is a fair bit more generous than your average 16-bit shooter. 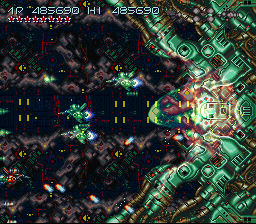 Its difficulty is adjustable — adequate players are challenged enough on easy while space ship shooting maniacs are taxed on the hard mode. This makes Axelay accessible to a wider audience. 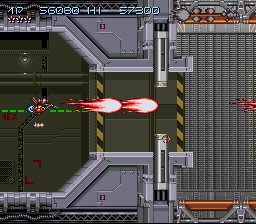 It also comes equipped with an auto turbo feature, unlike a few other shooters from the era (I’m looking at you, Aero Fighters and U.N. Squadron). 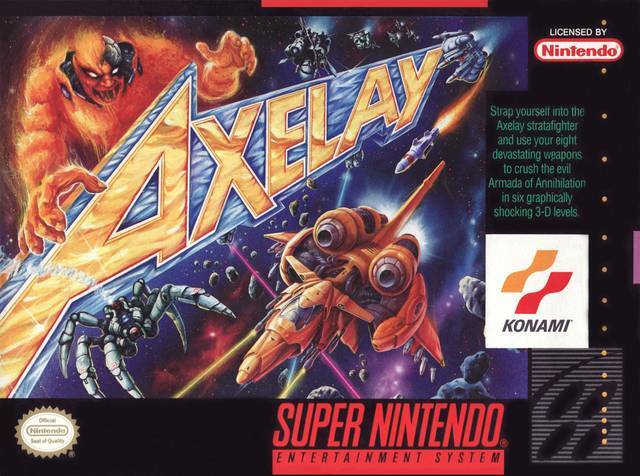 Highly recommended, Axelay is one of the best shooters on the SNES and no respectable Top 100 SNES list is complete without it.